Strasbourg, not only the capital and principal city of the Alsace region of France, but also a UNESCO World Heritage site thanks to the richness of its architectural heritage in the town center, the "Grand Ile". 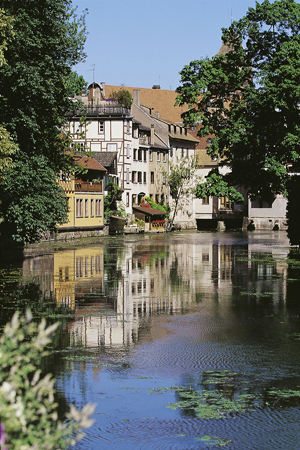 It is very rare for an entire town center to receive this distinction, but in 1988 Strasbourg was the first site in France to receive such an honor. Situated on the Ill river where it flows into the Rhine on the border with Germany, Strasbourg also is the official seat of the European Parliament! 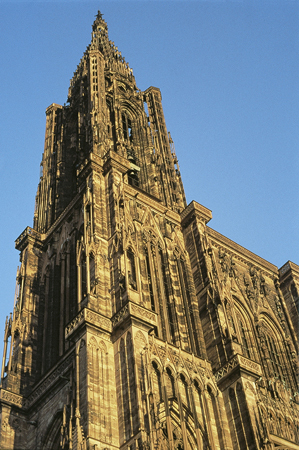 Overlooking the city is the Strasbourg cathedral, a masterpiece of Gothic art. The outside of the cathedral is like a picture book of the Middle Ages with hundreds of sculptures, which almost seem to leap out at you from the wall, make great use of light and shadow effects. There is so much to see from the stained glass windows to the huge organ, but make sure you do not miss the Renaissance astronomical clock, which mechanism dates back to 1842. Admire the parade by the apostles every day at half past noon! Visit the Petite France quarter, the most picturesque district of old Strasbourg, where Fishermen, millers and tanners once lived and worked. The magnificent half-timbered houses date from the 16th and 17th centuries. Their sloping roofs open out onto lofts where hides were once dried. Strasbourg is also known for its outstanding cuisine. Cooking is more than just an art of living, it is vibrant and living culture backed up by centuries of tradition, yet constantly experimenting and innovating, driven on by the talent of the great chefs and the dynamism of the city's restaurant owners. Traditional Alsatian specialties such as sauerkraut, baeckeoffe , flambe tart, spaetzle and foie gras can be best enjoyed in a "winstub", local Alsatian taverns known for their friendly atmosphere. Strasbourg is renowned for its hundreds of restaurants and brasseries offering the latest culinary trends and dishes from all around the world. When you hear some locals talk you might ask yourself: Is this French? Is this German? Actually, the Alsation dialect is a mixture of both. This area went back and forth couple of times in history and you will still hear older people in the rural areas speak German dialect.